Kumarakom is undoubtedly one of the most picturesque places in Kerala, God's own country. Kumarakom village is a group of 27 islets surrounded by canals branching from the Vembanad lake in Kottayam District. The main mode of transportation here is through the water ways in small canoes, boats or very large 'Kettu Valloms' (house boats). The back waters of Kerala intermingled with lagoons and lakes lie parallel to the Arabian sea. Vembanad, the largest lake among them covers an area of 200 sq km, and is bordered by the districts of Alappuzha (Alleppey), Kottayam, and Ernakulam. Rated as one of the top 15 beautiful spots in the world by the 'National Geographic', Kumarakom, 16 km from Kottayam town is a perfect tourist destination as it has several fascinating vistas like the soothing backwaters intermingled with small islets and canals, thick mangrove forests, green paddy fields, coconut groves, hundreds of varieties of migratory birds, traditional country crafts etc. The scenic backwater tourism destination, Kumarakom offers visitors exotic sightseeing, boating and fishing experiences. Vembanad lake has a variety of marine life including the delicious tiger prawns, pearl spots, crabs etc. A ride on the luxurious houseboats, traditionally known as Kettuvalloms (over 60 ft in length the boat has been remodeled with all basic facilities like bedrooms, toilet, kitchen, bathrooms) is an interesting one. One can have a close view of the country side, fishing activity, coconut palms lining the waters and also relish the fresh fish delicacies, which are truly mind-blowing experiences. There are beautiful resorts here which offers comfortable stay, Ayurvedic massages, yoga, cultural tours, water skiing and boating facilities. Heritage homes- traditional large houses ('tharavadu') in typical Kerala style architecture, are also available for stay. Spread over 14 acres (57,000 m�) on one of the islets, the Kumarakom Bird Sanctuary here is the major attraction. A boat ride along the Vembanad lake is the best way to experience the sanctuary. The boat facility can be arranged with local fishermen at the entrance to the sanctuary. A two-hour rowing boat trip cost about 200-250 Rs, and is best undertaken in the evening or early morning to avoid the afternoon sun. House boats or speed boats are also available on hire. 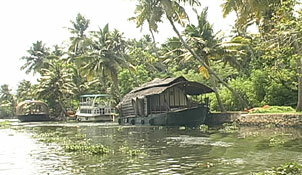 Kerala State Tourism Development Corporation provides boating facilities. An ornithologist's paradise, the sanctuary is home to numerous species of birds, such as Darters, Bitterns, Teal, Waterfowl, Cuckoo, Wild Ducks, Brahminy Kites, Marsh Harries, Teals, Wild ducks and Herons. It is also a resting site for Siberian storks which migrate to Kumarakom every winter. A 50 year old bungalow, Baker's Mansion where a British missionary George Baker lived for 60 years is located right in the middle of the sanctuary. It is now maintained by the Taj group of hotels. The best time to visit the park is between November and March. The Kumarakom Bird sanctuary is open daily from 10 am to 6 pm. The Ayemenam village described in the Booker Prize winner novel 'The God of small things' by Arundhati Roy is located very close to Kumarakom. 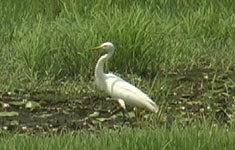 Pathiramanal a small beautiful island in the Vembanad Lake is a favourite haunt of hundreds of rare migratory birds. This island in 10 acres can be accessed by boat from Kumarakom. 2km from Kumarakom amidst rubber plantations is a picturesque spot Aruvikkuzhi waterfalls, where water cascades down from a height of 100 ft.